Space Safety » Archive » Space Exploration » Destination Mars » Is A One-way Mission To Mars Safe? Never before has the idea of a manned mission to the red planet been as present and as real as it at present. The various Mars manned missions proposed in recent years and the continuous developments and improvements of human spaceflight systems (particularly in the USA) have re-surfaced this topic and brought it into the forefront of public discussion. For decades, it has been the goal for a many of the world’s space agencies and organizations, to land a man on Mars. Recent interest and support on the topic seems to bode well for the realization of this goal. However, with this increased enthusiasm and excitement, it is easy to disregard or forget the challenges and difficulties that such a feat entails. Even though more than 50 years have passed since mankind first ventured into space, the challenge of putting a man on Mars presents additional complications that the space industry has not faced before. In this paper, we analyse the hazards associated with a manned mission to Mars, with the specific focus on “one-way” human missions (OHM). The idea of a one-way mission (also known as “Mars to stay”) was first proposed in 1996 and has, since then, led to a several subsequent proposals. Despite slight variations in the content of these proposals, they all rest on several common arguments: A one-way mission to Mars (i.e. not involving a return of the crew to Earth) has some advantages when compared to a round-trip mission, requiring less mass at launch and lower initial costs. This could help mankind reach Mars earlier. A one-way mission does, however, require a different approach to the design of the habitat modules and present additional risks. Launch is one of the most critical phases of any space mission, as it encompasses some of the mission’s greatest risks. In the past, failed launches have brought disastrous consequences to the mission and even caused fatalities. While our current launch vehicles have a better safety record than some previously used ones, none of them is currently is compatible with a Mars mission. Therefore, a new launcher design would be necessary, such as NASA’s Space Launch System (SLS). Furthermore, should the mission use a radioisotope thermoelectric generator (RTG) or nuclear reactor as power, as suggested in many current proposals, the proper handling of the nuclear material would pose an added difficulty with inherent hazards. During the spacecraft launch, a series of incidents can lead to the loss of the mission and even of the crew. There is the possibility, for example, of inadvertent ignition caused by induced currents or electrostatic discharges or overheating of the propellants due to a fire or accumulated energy from micro vibrations. Note also that, the new materials introduced in the design of the SLS, such as the insulation material of its solid rocket motoradd to the inherent uncertainties of the launch vehicle, both at sub-system level and at system level. One of the biggest hazards involved in journey between Earth and Mars is associated with the exposure to the direct solar radiation. This radiation can damage the DNA in human cells, leading to mutations and higher risk of cancer. Studies have demonstrated, the potential for cataracts, cancer, cardiovascular diseases, musculoskeletal issues and damage to the central nervous system. Exposure to radiation and high-energy particles were found to be associated with cognitive problems. Low levels of radiation generally do not pose a significant health risk to astronauts; however, the effects of radiation are cumulative: long term exposure increases the lifetime risk to astronauts. Crews of future long duration interplanetary missions will have to travel through the Van Allen radiation belts, and will be exposed to more high energy radiation exposing them possibly serious health effects. We still need to consider the landing on Martian surface. Throught the history of Mars exploration, many have been the missions that failed on this critical mission phase. Not only do we need to consider the direct risk of the spacecraft by a catastrophic even during landing, but it is also important to account for the expected uncertainties in the landing location. Current missions have landing elipses with areas in the order of 500 km2 (e.g. Mars Science Laboratory). On a one-way human mission to Mars, the habitat and the operations represent the most critical aspect of the mission, not only in terms of time spent, but in terms of possible risks. Mars presents a very hostile environment and to be able to live there for an extended time requires very complex and robust systems. 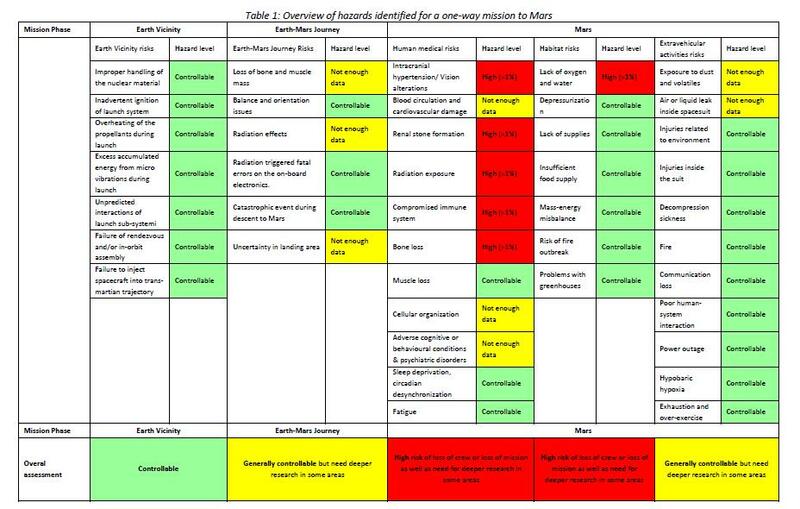 The specific risks of a prolonged stay on Mars can be separated into three distinct types: health risks; habitat specific hazards and hazards associated with extra-vehicular actives (EVAs). The astronauts will be experiencing many stressful conditions: radiation, microgravity, varying g-forces, anxiety, psychosocial stressors, changes in health status, loss of body mass, sudden unexpected illness, physical injuries etc. These health issues can generally be divided into short-term and long-term problems. Short-term health issues include problems which may appear during the mission but can disappear after stabilization on the Mars surface (after habituation). Other known short-term health issues include sleep deprivation, fatigue, psychiatric disorders, compromised immunity and loss of muscle mass. Long-term effects are more serious since, in many cases, they bring irreversible changes to human health. There is no clear solution to reduce the effect of these hazards. For example, recent research implies that gravity helps cells create patterns. In Mars’ lower gravity, the microtubules in developing cells might not organize the way they would on Earth, causing different cellular organization with unknown effects to the crew over the long term. Furthermore, radiation exposure on the surface represents an additional critical hazard. Due to the lack of magnetosphere, Mars leaves the astronauts with minimal protection against the radiation coming from the Sun. As can be seen in the figure below, the accumulated radiation dose within only 500 days of exposure is already higher than that of the average stay on the ISS or the 180 day transit to Mars. A long stay on Mars seems to imply accumulated doses above what is currently allowed by most space agencies for their astronauts. It is clear that the only way to sustain human life on Mars for a long time is to use a Closed-Loop Life Support Systems (CLLSS). The International Space Station (ISS) experience shows that the TRL for oxygen generation is high, but at the moment it requires water resupply. This water could, in theory, be harvested in Mars from the natural environment. But since ISRU technologies have not yet been flight tested on Mars, this introduces a high level of risk into any mission that relies on them. While the risk of lack of oxygen is substantial, without resources obtained through ISRU technology, there is also a high risk of fire outbreak if the oxygen content of the habitat’s environment exceeds 30% molar fraction, which NASA has defined as its safety threshold. This threshold may be reached due to growing of food crops within the habitat, all of which will produce excess oxygen. Currently, no technology exists to decrease the molar fraction of oxygen within a closed-loop environment, so mitigating the risk of fire outbreak depends largely on the development of this system. Periodic resupply missions could be an alternative to ISRU. However, Mars resupply missions are significantly riskier than ISS resupply missions, as a missed launch window for a Mars resupply entails a delay of up to 26 months, whereas ISS launches may be attempted again after only a few days. In order to minimize the risk of loss of crew due to lack of supplies, extra resources must be stored in the habitat to account for the possibility of resupply mission delay or failure. It is infeasible to rely solely on resupply missions for crucial resources such as food and spare parts, meaning ISRU and in-habitat manufacturing must be conducted in order to sustain an OHM. EVA capabilities are defined by many different reports as a critical element for future human space exploration programs. On Mars, where the gravity is 3/8 of the Earth’s, exploration missions would require continuous effort for a long period of time. Current mission proposal require at least three 8-hour EVAs per week covering a range beyond 10 km. Given the Mars terrain’s relief (Mont Olympus is culminating at 25 km high, 4 times Mount Everest), EVAs might require intense and complex tasks like rock climbing, running, or excavating. Planetary surface dust and volatiles can be a particularly abrasive element (as seen with the Lunar regolith during the Apollo missions) that may lead to injuries, damage to the external layers of the spacesuit, and can lock the mechanical parts of the suit (leading to reduced mobility). Exposure to these volatiles can thus impair mobility, cause injuries, damage equipment, and reduce visibility. Dust exposure may also lead to respiratory, or ocular damage. The risk of fire is one of the most critical risks during EVA, but it has been well controlled. In an environment naturally rich in oxygen, the risk of fire increases. The risk of fire also plays into the trade-off between pressurization and partial pressure of oxygen inside the suit involving the risk of decompression sickness and the risk of mobility. Even though the severity of the risk is high, the mitigation strategies adopted have been efficient to mitigate it: use of specific material inside the suit, controlled oxygen partial pressure. Another extreme situation is power outage during an EVA which can lead to loss of communication, loss of life support systems and most probably death. From the Earth vicinity mission phase analysis, no major hazards or risks were detected. It is, however, relevant to point out that separating the mission into different launches and transfers for crewed modules vs. supplies/habitat modules seems to offer a safer approach. Moreover, sending the supplies/habitat modules before the crewed spacecraft offers the possibility to remotely test them before sending the crew. Throughout the transfer to Mars, the biggest hazard was found to be the direct exposure to the radiation from the Sun. Further studies are needed, but everything seems to indicate that the accumulated dose can be kept to acceptable levels. The long stay in Mars, which is one of the main characteristics of this mission architecture, implies its own set of hazards. Medical hazards from long exposure to the environment include intracranial hypertension, vision alterations, renal stone formation, radiation exposure, compromised immune system and bone loss, among others. All these mentioned conditions were determined to have a high risk (higher than 1%) of loss of crew or loss of mission. Other medical conditions such as cellular organization or blood circulation and cardiovascular damage can also be a risk. However, not enough data exists today to make this assessment. Extravehicular activities (EVAs) will absolutely be necessary for such a mission (for maintenance, for repair, etc.) and there still are some things we need to fully understand to perform them safely on Mars, such as the effects that the exposure to dust and volatiles might have on the suits and crew. But from a general point of view, EVAs appear not to present a high risk to the mission or crew. The primary concerns associated with a long-term Mars habitat involve Environmental and Life Support Systems (ECLS) technologies and resupply missions. The risk of lack of oxygen in the OHM mission is significant due to the low Technology Readiness Level (TRL) of in-situ resource utilization (ISRU) technologies. Furthermore, the long exposure of equipment to the Martian environment requires the use of an either extremely robust or extremely redundant system. A way to circumvent these issues would be to perform frequent re-supply missions. However, it has not been demonstrated that we have the capability to perform these reliably. Therefore, we have to consider this to be a high risk situation. Table below was formulated considering all the mission phases analysed. Hazards were identified and assessed according to their individual risk and the each of these hazards, taken into account for the overall risk assessment. After an overall assessment of the hazards involved in a one-way mission to Mars, it is noticeable that for several hazards, either not enough studies have been performed or there simply isn’t enough data available. There are several technologies that need to be further developed and medical conditions that need to be further studied before this mission architecture can be implemented. This article was written by Aureliano Rivolta, based on a paper presented at the 8th IAASS Conference “Safety First, Safety for All”, co-authored with Joao Lousada. Aureliano is one of the winners of the 2016 IAASS and Space Generation Advisory Council scholarships. Aureliano Rivolta is a PhD candidate at Politecnico di Milano in Italy and his research focus is robotics for On Orbit Servicing. He holds a space engineering master degree from the same university and for a short period has worked on vision navigation for lunar landing in the Space Robotics Laboratory at Tohoku University in Japan. After being coordinator for the “International Spacecraft Design Policies for On-orbit Servicing” project, he is currently co-lead of the Space Safety & Sustainability working group of Space Generation Advisory Council. Joao Lousada graduated from Instituto Superior Tecnico, in Portugal, with a Masters in Aerospace Engineering that included studies at Universitat Politecnica de Catalunya, in Spain, and University of Victoria, in Canada. He is a Systems Flight Control Engineer (STRATOS) for the Columbus Module of the International Space Station. He is also an active member of multiple volunteer organizations related to the space sector, such as the Austrian Space Forum or the Space Generation Advisory Council, where he has been acting as co-lead of the Space Safety and Sustainability project group and as National Point of Contact for Portugal.